This post contains affiliate links. This is also a sponsored post with Instant Pot. All thoughts and opinions are my own (because you KNOW I love my Instant Pot!!). The giveaway has ended, but enjoy this awesome free recipe! 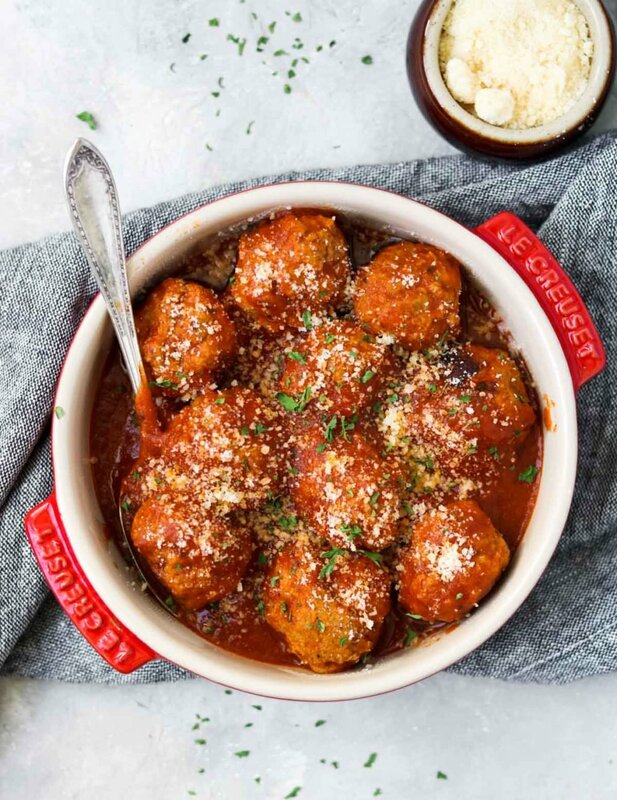 These ground turkey meatballs are super simple to make and cook in a flash in the Instant Pot. They are full of Italian seasonings and spices. But no onions and no fresh garlic, making it a super easy and kid-friendly dinner. When my kids say “what’s for dinner, Mom?” and I say “turkey meatballs”, they actually say “YES”, with a fist pump! It definitely gets a 5 star vote from my kids. I LOVE using my Instant Pot! I am telling you it has changed our my dinner routine completely. I am able to set it and forget it. No standing in the kitchen, stirring, and waiting. Once it is set I can walk away, get things done, and listen for the beep. Even if I completely forget to thaw chicken for dinner, I still know I can get dinner on the table in 30 minutes, using my Instant Pot (for example my Instant Pot Chicken & Rice Soup , which is made with frozen chicken!!!). The other thing I love about my Instant Pot is that it is takes the place of another bulky kitchen appliance, the slow cooker. To use the IP as a slow cooker simply set it to the slow cook function, set your time, and keep the pressure valve open on the top. So easy! One thing to consider, that not a lot of people mention, is that a recipe may say it takes 10 minutes to cook, however that does not include the time that it takes the pot to come to pressure. That can be anywhere from 5 minutes to 10 minutes depending on how much food/liquid you have in the pot. But, the actual cooking time is SO much shorter than traditional oven or stove cooking that it makes up for that time. The model I use and recommend is the Instant Pot Duo Plus 60 6 quart 9-in-1, which I absolutely love. To be honest I will probably never know how to use all 9 functions, like the yogurt or sterilize functions. But, they are there if I need them! The main reason I love this pot is because of the size, 6 quarts. It is large enough for just about any recipe and is a great size for a family of 2 up to 8. I would also recommend the Instant Pot Duo 60 6 quart 7-in-1, same size, just less functionality, which is probably just fine! 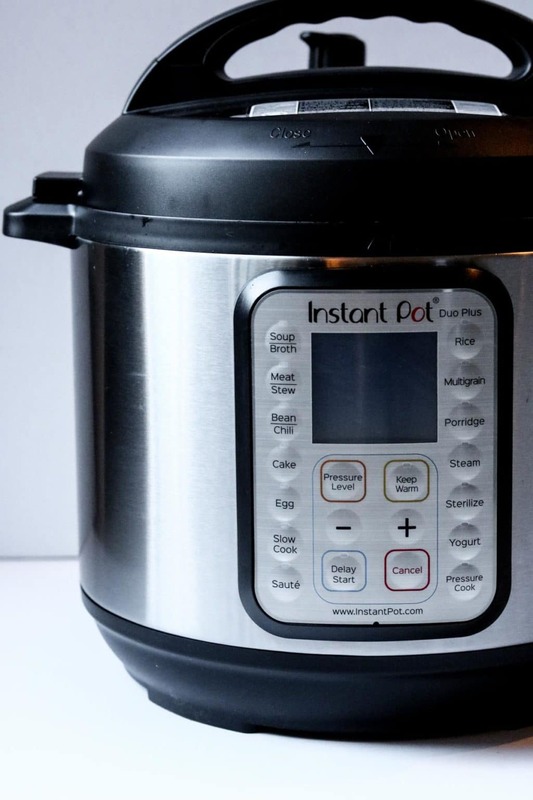 I am so excited to partner with Instant Pot to give one lucky winner an Instant Pot Duo Plus 6 quart 9-in-1, the same pot I use. This is not the time to save on calories! Ground turkey is already considered a lean protein, so go ahead and get the 93% lean turkey. The 99% lean turkey will not give you the correct flavor or texture that you want in a meatball. When the 99% lean turkey is cooked it can tend to resemble the texture of plastic, ewwww. Not what I am looking for in a meatball. Unless you are on a strict diet I would steer clear of the 99% lean ground turkey. 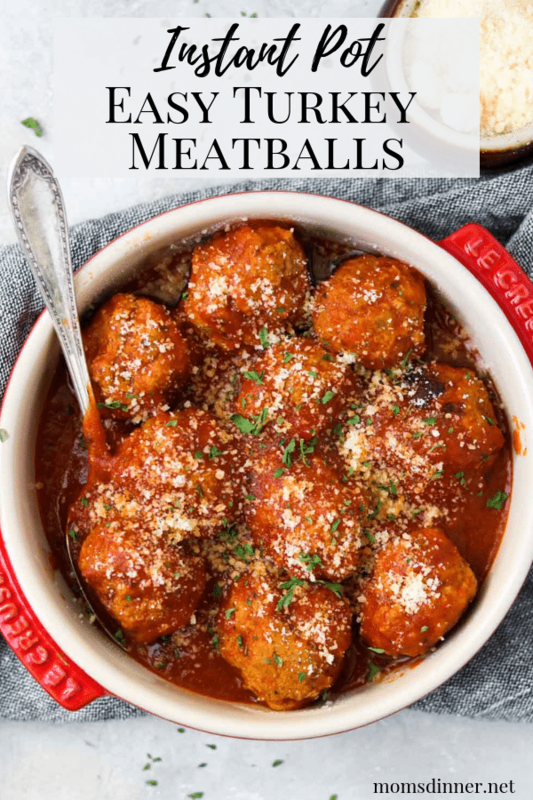 This is truly a super simple meatball recipe. Put all the ingredients (except the oil and marinara sauce) in a mixing bowl. With clean hands, lightly mix the ingredients together just until they are combined. I like to have slightly wet hands when I form the meatballs. This is a great kitchen tip to keep the turkey from sticking to your hands. Grab about 1 1/2 to 2 tablespoons of turkey mixture and roll it around in between the palms of your hands to form a ball, about the size of a ping-pong ball. Pour about 2 teaspoons of olive oil in the bottom of the Instant Pot. Place all the meatballs in the prepared Instant Pot. 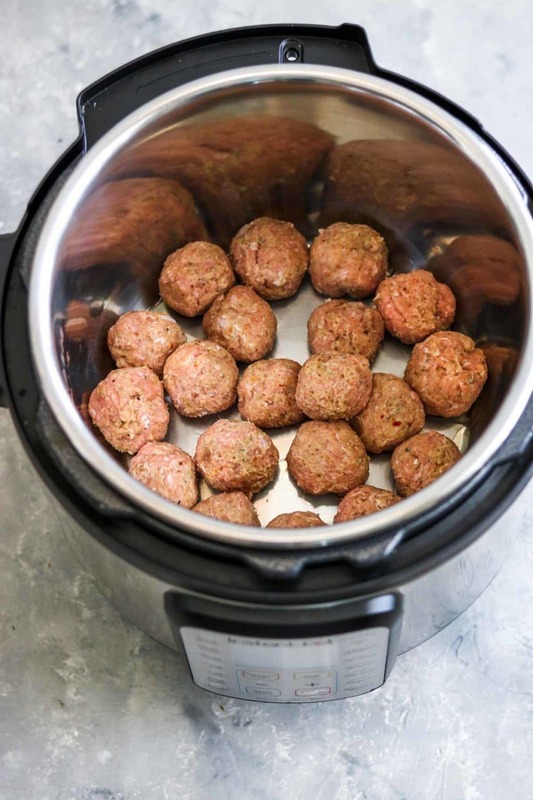 I am able to get 1 layer of meatballs in my 6 quart Instant Pot. If you have to layer the meatballs, that is okay… just lay the top layer in lightly. 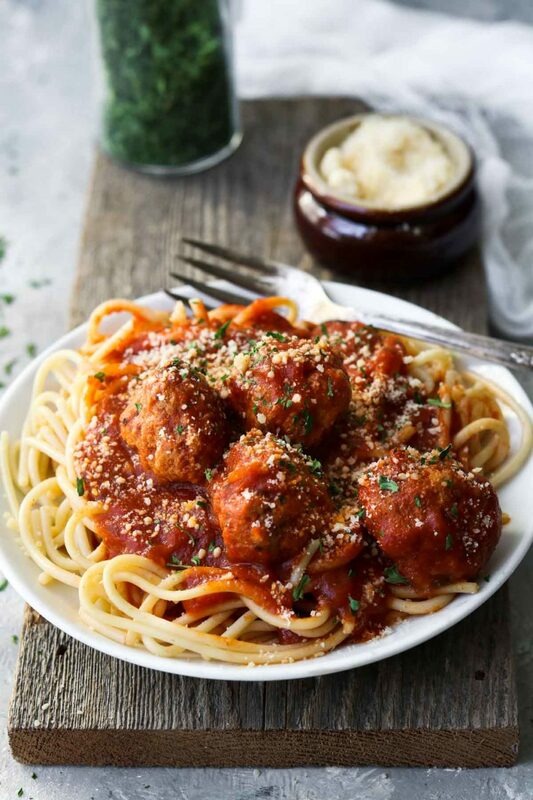 Pour a 24 oz jar of your favorite, store-bought marinara sauce over the meatballs. Pop the lid on, seal the vent, and set the pot to meat/stew or manual mode on high pressure for 10 minutes. 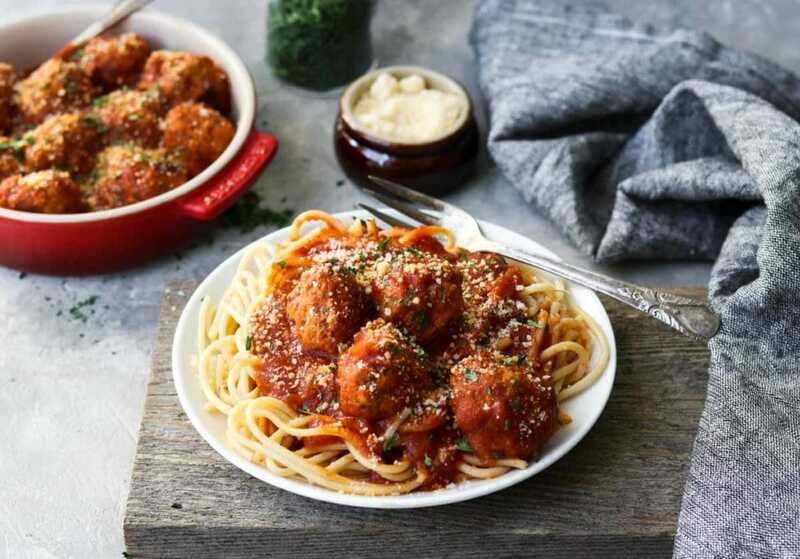 If you plan to have the meatballs with pasta, you can cook the pasta while the meatballs cook in the Instant Pot. When the pot beeps at the end of 10 minutes (plus pressure time), do a quick release. Lightly stir the meatballs in the marinara sauce. There may be some light browning on the bottom of the pan, that is just extra flavor! This is a super versatile recipe. It can be an appetizer, sandwich, or entree. 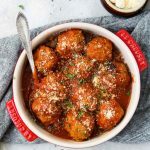 I hope you give this recipe for Easy Instant Pot Turkey Meatballs a try in your kitchen. 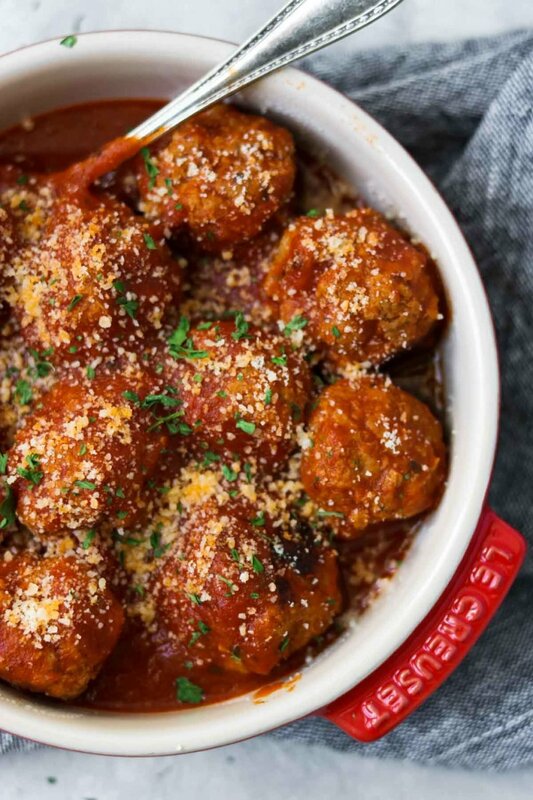 These easy-to-make Turkey Meatballs are cooked in the Instant Pot in just 10 minutes! No chopping or sauteing required. They are perfect served as an appetizer or over pasta for dinner. This is also a kid friendly recipe, approved by my two super picky kiddos. In a mixing bowl, using clean and slightly wet hands (which helps the turkey not stick to your hands), lightly mix the turkey with the Italian dressing packet, bread crumbs, Greek yogurt, Dijon mustard, and Worcestershire. Do Not add extra salt, there is plenty of salt in the dressing packet. 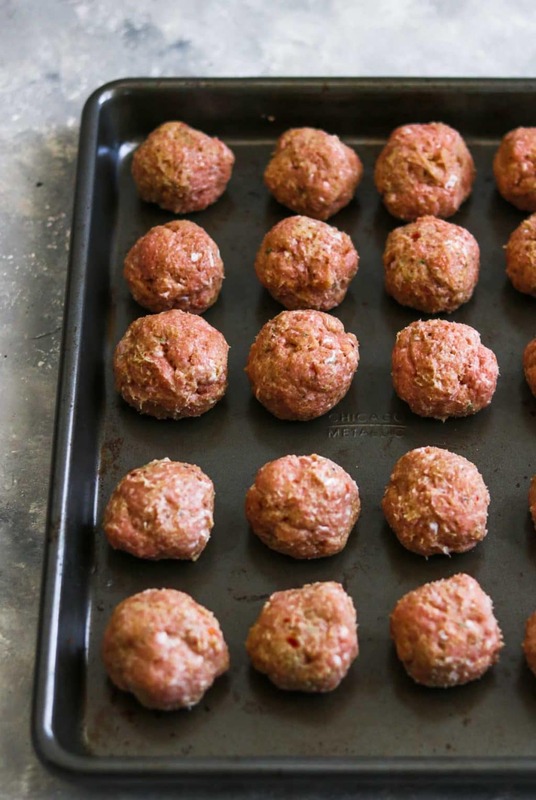 Grab about 1 1/2-2 tbsp of meat mixture at a time and form 20 meatballs. Pour the olive oil in the bottom of the Instant Pot. Add all the meatballs to the pot. It is ok if you need to make two layers, just lay the second layer of meatballs in lightly. Pour the jar of marinara and water over the meatballs. Close the lid and turn the pressure vent to seal. Cook the meatballs on meat/stew or pressure/manual mode, on high pressure, for 10 minutes. Lightly stir the meatballs and serve. This was so easy, and super delicious. Thank you for sharing the recipe. It is a keeper! I served it with carrot spirals. Everyone raved about it. Is there a substitute that we can use in replace of the yogurt? what about sour cream? thank you! The instant pot is one of the best inventions ever. i absolutely love mine and am using it constantly. 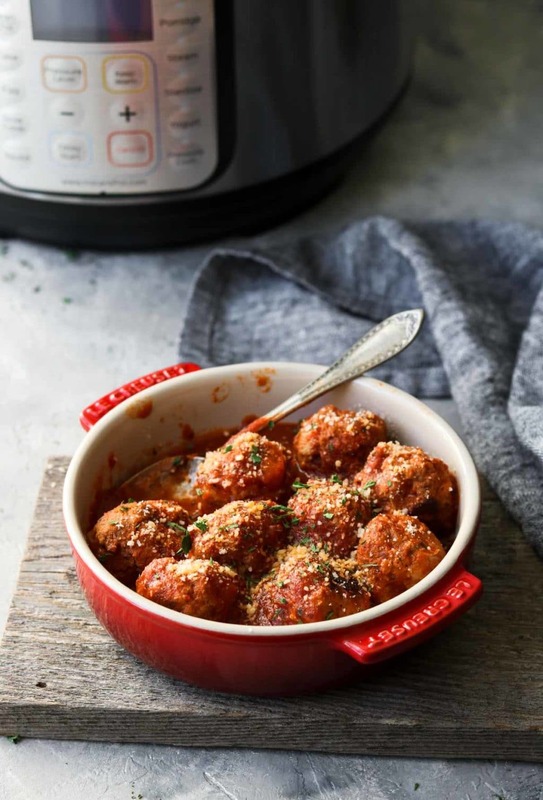 Those meatballs look incredible susie, and so easy in the instant pot! This is a crowd pleasing recipe. It is even kid approved! Delicious!! Such a wonderful giveaway and recipe looks AMAZING!!! !